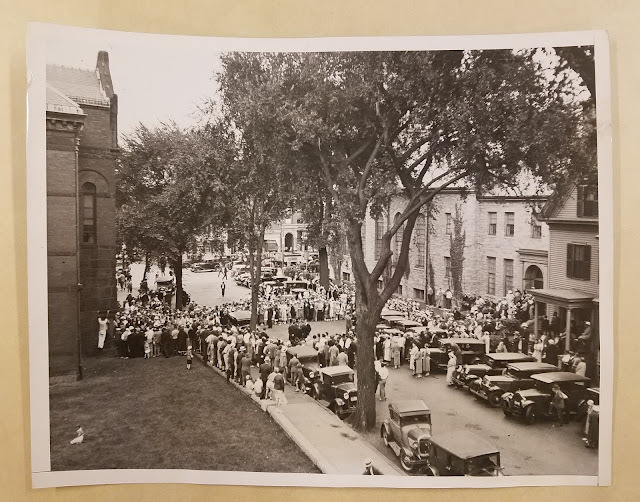 Crowd outside a Salem courthouse during the trial of Jessie Costello, 1933. In February 1933, Nellie Ayers, a door-to-door saleswoman, peddling fudge was welcomed into the Peabody home of Jessie Costello, her husband William, and their children. After a few minutes of speaking with Nellie, Jessie agreed to buy a pound of fudge and excused herself to retrieve her purse. Moments later Jessie returned to where Nellie was waiting, hysterically screaming that her husband was dead on the bathroom floor. Jessie sent Nellie away without payment, stating that she was unable to think of sweets at such a difficult time. An autopsy performed on William after his embalmment revealed the presence of cyanide in his system. On March 17, 1933, Jessie Costello was arrested for the murder of her husband. Thus beginning one of the most captivating trials the pre-television world would ever see. Inside the courtroom, Jessie dismissed accusations of guilt with a nonchalance uncommon to trials of murder. A pharmacist claimed to have sold Jessie cyanide, the day of her husband’s death, stating that he warned her about the deadly poison. She replied “you call that poison?” going on to state that she used the substance to clean her stove. Jessie cited her husband’s ailing health and constant indigestion for causing him to commit suicide. The prosecution came back with evidence that Jessie had also purchased empty capsules, similar to what was found in her husband’s stomach. Following newspaper reports, the court house became surrounded by onlookers, hoping to catch a glimpse of the newest celebrity. 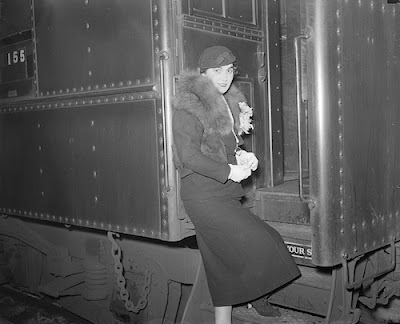 Jessie received over 500 love letters daily as well as a dozen roses from the trials bailiff. The all-male jury pooled their money to buy “the smiling widow” a box of chocolates. However, Jessie already had an admirer. A married, police officer, named Ed McMahon. McMahon described an affair he had with Jessie Costello prior to William’s death. He implied Jesse was an outgoing, flapper, trapped as a housewife in a dull marriage and told of their affair in detail. Newspapers refused to print McMahon’s testimony as they thought it too crude but printed it in little red booklets which immediately sold out. Ed McMahon became dubbed “the kiss and tell cop” and became the villain of the trial. Jessie admittedly denied the affair, saying that any relationship she did have with McMahon was purely spiritual. Jessie’s celebrity however, did not end with the court proceedings. She quickly was offered contracts on Broadway, and began receiving requests to tell her life story. She hired a theatrical agent and was asked to perform screen tests for Hollywood studios. During this time, she turned down a $20,000 contract to appear in a 10-week burlesque show, believing it was beneath her. She purchased new clothes and vacationed as a celebrity. Her short-lived fame would end however when Hollywood censors opposed her benefiting off of the death of her husband. Studios begrudgingly followed suit and withdrew all offers to work with Jessie. In a last attempt to maintain status, she approached the burlesque houses that she had previously turned down but found that they were no longer interested. Unable to find work, Jessie became a hostess at a Boston tavern and later moved with her children to New Hampshire. She remained certain she would find fame again. Jessie Costello died on March 15, 1971. Her funeral was attended by nearly 200 mourners. Images above are from their collections. She's a very interesting person for sure. Glad you enjoyed it! Hi Jen. I enjoyed reading your article. I am doing a research project that involves Jessie Costello, and I am wondering if you might suggest some sources that I could read to learn more about her schemes to "cash in" on her brief moment of fame. Hi MTM - New England Historical Society recently wrote a very detail article about her which could provide additional sources. Most of what I used was Primary Sources such as newspapers from Salem Public Library and Salem State University Archives. I hope that helps! Thank you. Could you provide me a link to the NEHS article? Thank you.